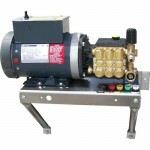 Chemical Injector Allows you to siphon and mix detergents. 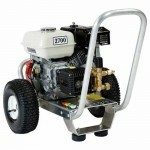 Semipro pressure washer with gasoline Honda engine and CAT 3DX pump. 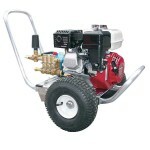 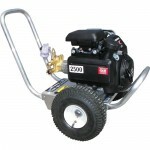 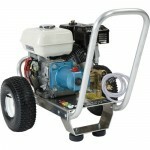 Features of this pressure washer include: gun/wand assembly with quick connerctors, high pressure hose with quick connectors, chemical injector assembly, 5 nozzles, aluminium frame with dual handles, 50 mesh inlet filter, adjustable pressure unloader, big pneumatic tires, padded shock absorbing feet and steel axle. 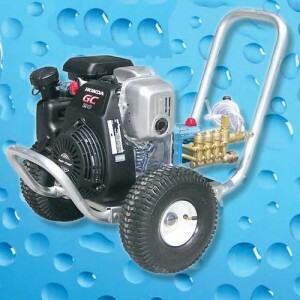 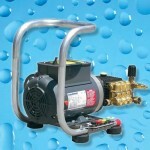 To prevent overheating in bypass mode this power washer has thermo sensor.